Friday, April 6, 1888 Pleasant till very last P.M. when sprinkles of rain began to fall. 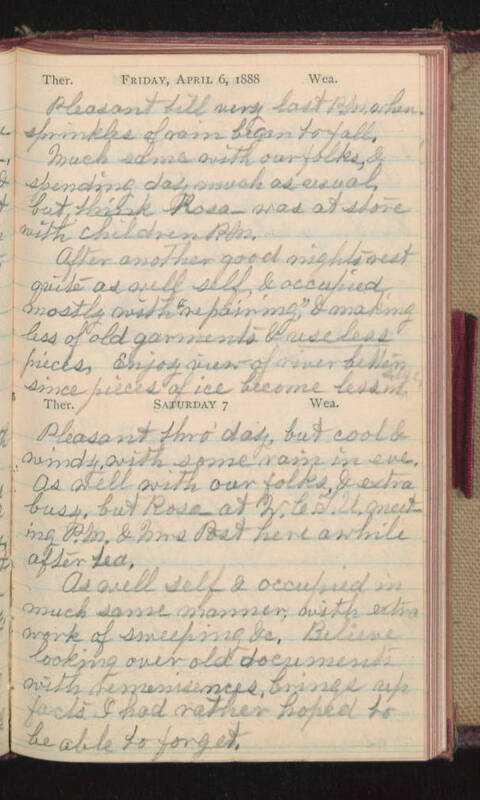 Much same with our folks, & spending day much as usual, but think Rosa- was at store with children P.M. After another good nights rest quite as well self, & occupied mostly with "repairing", & making less of old garments & useless pieces. Enjoy view of river better since pieces of ice become less in size. Saturday 7 Pleasant thro' day, but cool & windy with some rain in eve. As well with our folks, & extra busy, but Rosa- at W.C.T.U. meeting P.M. & Mrs Post here awhile after tea. As well self & occupied in much same manner, with extra work of sweeping &c. Believe looking over old documents with remenisences, brings up facts I had rather hoped to be able to forget.